Are you looking for an ADVENTURE and ACTION? Then White Water Rafting is just the thing! 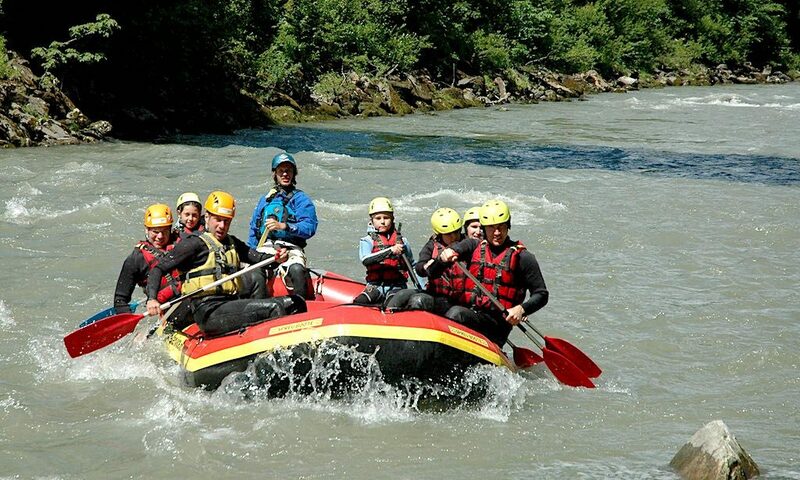 The rivers Salzach and Saalach are among the most beautiful rafting rivers in Austria. On our tours you will find a great natural experience – which is also on a rainy day. State-certified and experienced guides offer the perfect balance between fun and safety. A timely registration is necessary for organizational reasons. Individuals are booked to other tour participants! Enjoy the fascination of white water with us! The Salzach river offers perfect conditions for beginners and also for those who have white water rafting experience already! 12 km length, difficulty II-IV, high waves, nice rapids, sprinkeling water and interesting paddle passages make this tour your holiday highlight! Light to medium tour, nice view and good fun. 10 km of whitewater in the middle of a beautiful natural landscape. 10 km of light white water in the National Park Saalachtal. The tours will be offered only under optimal conditions. In case of high water, we reserve the right to change the tour. All participants in our rafting tours are covered by liability insurance! Our rafting tours are available between 1. May – 15. Sept. / Tours daily at 9:30am and 2pm. A timely registration is necessary and facilitates our planning and organization. Please contact us or book the tour directly online. Yes! We offer changing rooms for your use before and after your trip. Don’t forget to bring a towel and swimwear. A modern rafting equipment is obligatory. It consists of neoprene suit, neoprene jacket, neoprene shoes, life jacket and helmet. Swimwear, shorts or a bathing suit and a towel, possibly T-shirt, for colder days a warm sweater and a good mood! Our rafting tours take place almost daily. The morning tour at 09:30 am and the afternoon tour at 2pm. 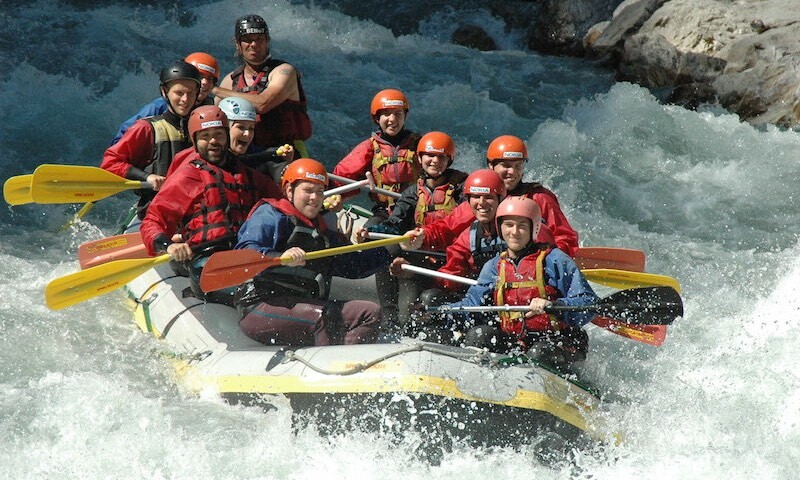 ● How many people can you book a rafting tour? You can book a tour as an individual, as a couple or as a larger group. We organize rafting tours from 4 participants. If you are alone you will be in the boat with other people. ● How many people can go in one raft or how big can the group be? Our boats are for 8 – max. 10 persons plus the Raftguide approved. Depending on the size of the group, we plan a corresponding number of rafts for your team. ● At what age is required for children ? At the tour Saalach we have a minimum age of 8 years for children! On the Salzach tour the minimum age is 10 years. For all kids up to 14 years an adult supervisor is required. All participants must have safe swimming skills. ● Are the rafting trips even in bad weather? Rainy weather is basically no problem as all participants get a good neoprene equipment and after the first waves you will be wet anyway! Due to weather conditions, rafting trips are only canceled if safety-relevant reasons exist. Rafting is one of the best rainy day activities because getting wet is part of the fun! Bei den Touren Salzach und Saalach sind keine Vorkenntnisse nötig. Alles was sie für Fahrt wissen müssen, erfahren sie bei der Einschulung im Trockenen. Alle Teilnehmer müssen jedoch sichere Schwimmkenntnisse haben. By a Gift voucher for yourself, your friends, acquaintances or family members! The vouchers are valid for 18 months and can be booked directly here! Are you looking for some more Adventure? Then canyoning is just the thing! Discover the untouched nature in the gorges of the province of Salzburg and join our canyoning adventure. Want to drive SEGWAY in Zell am See? Experience a new feeling and explore Zell am See on a Segway. The speed is controlled by weight shifting. For any question please fell free to contact us!